The June 2014 Scanfest will take place here at AnceStories this coming Sunday, June 29th, from 11 AM to 2 PM, Pacific Daylight Time. Recently, Ancestry released a database titled "Michigan Divorce Records, 1897-1952" . (Images are only available for records from 1897 through 1938; the rest is a transcribed index.) To say I was in genealogy heaven is an understatement! I have several direct ancestors and some collateral relatives who divorced during this time period in Michigan. Several of those direct ancestors married and divorced multiple times, which makes unearthing all their marriage and divorce records fascinating! I'm no expert on divorce records, but I have had the opportunity to obtain and analyze a variety of them for a number of my ancestors. I'd like to share a few tips that I've discovered. If you have any of your own, please feel free to post them in the comments below. The Handybook for Genealogists: United States of America are all classic U.S. resources available at most public and genealogical libraries. The Red Book is also available on Ancestry's Wiki , for free. 2) Understand that there really were more divorces in the past than we realize or would like to admit. This ties into Tips 5 and 8. While statistically, the percentages were much lower than today, much of that was due not just to societal norms and religious frownings upon divorce, but to the fact that the laws really discouraged--and in some cases completely prohibited--divorce. People were not more saintly in the past than they are in the present. Remember that in the big picture of history, women were considered little more than the property of their fathers or husbands. It could be very difficult, socially, legally, and financially for a woman to show just cause for divorce, such as adultery, drunkenness, non-support, and physical abuse. It was much easier for a man to divorce his wife than the reverse. However, women DID divorce their husbands successfully and the records prevail to prove this. 3) There are many divorce records and indexes online. Joe Beine, the webmaster of DeathIndexes.com has a great list of divorce records (mixed with marriage and birth records) here. 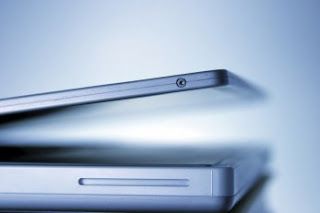 Cyndi's List has multiple categories under "Marriages & Divorces" to help you find records online and offline, as well as articles and guides for those who are new to divorce research. Don't forget to check out online newspapers for legal notices, gossip columns, and local news items mentioning a pending or completed divorce. 4) There are even more divorce records and indexes OFFline. Categorize this under "Not everything is on the Internet, nor will it all eventually get there." For very early divorces, generally before the mid-1800s, check the state's records, especially indexes of the state congressional journals for dissolutions of marriage, divorces, private acts, or the couple's surname. Otherwise, check with the state's Department of Vital Statistics and the county's civil court records. An essential resource is Christine Rose's Courthouse Research for Family Historians: Your Guide to Genealogical Treasures. Chapter 9, "Civil and Criminal Court," is especially helpful. Offline newspapers (microfilmed or archived hard copies) are also a good resource. 5) Compare marriage dates to divorce dates and check out EVERY marriage and divorce for EVERY partner. This gets complicated when you have an individual who married and divorced multiple times, because it's likely that most of their partners also did so. You could have a good dozen marriages and divorces that spin off from your original divorced ancestral couple. It always amazes me how soon after a divorce was granted that a person turned around and remarried someone else. Obviously, they were just waiting for that divorce decree to come through so they could marry their next victim partner. 6) Realize that everyone who got "married" may not have because they couldn't/didn't get a divorce from their last partner. I'm currently looking at an ancestor who purportedly was married four times. The first marriage, to my ancestor, ended with his death at a young age. My female ancestor then married a second time, but divorced that husband. She married a third time, but I am unable to find a divorce record for that couple. She then supposedly married her fourth husband in 1922. Interestingly enough, I can't find a divorce record for her fourth "husband" and his last known spouse, his second wife. My female ancestor and her fourth "husband" are found living with one of her sons in the 1930 census, and another one of her sons in the 1940 census. In both cases, the fourth "husband" is listed as "widowed" and a "boarder," while my female ancestor is also listed as "widowed" and is enumerated with her first husband's surname, and not her "husband's." At this point, I truly believe my female ancestor and her fourth "husband" never were legally married, although her death certificate and tombstone give his surname as her last name. P.S. In many census records, divorced people were listed as "widowed," or "married" but living separately from their spouses. 7) Check out "annulments." A brother of one of my direct ancestors was said to have had an annulment before he married his wife, with whom he had a long and happy marriage. Interestingly enough, that "annulment" shows up in an online divorce database, without images. Until I can get my hands on a copy of the actual record, I'm not certain it really was an annulment. Regardless, check divorce databases and indexes, as annulments may be listed with them. 8) Run EVERYONE's name in that time period and place through the divorce database or a printed index. I guarantee you will come across some surprises. Use the handy "find" or "search" features of your genealogy database to generate a list of these individuals. Genesee County, Michigan Circuit Court File no. 15759, Liber 6 of Chancery Decrees, p. 604, Mary J. York vs. Howard M. York, "Decree for Divorce," 7 January 1928; County Clerk's Office, Flint Township. 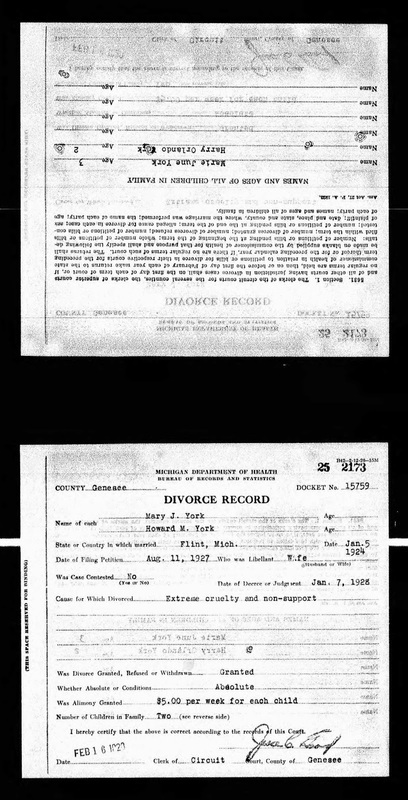 "Michigan, Divorce Records, 1897-1952," online database with images for 1897 - 1938 only, Ancestry.com (http://www.ancestry.com : accessed 12 June 2014), Howard M. and Mary J. York; citing Michigan Divorce Records, Department of Health, Bureau of Records and Statistics, Lansing, Michigan. 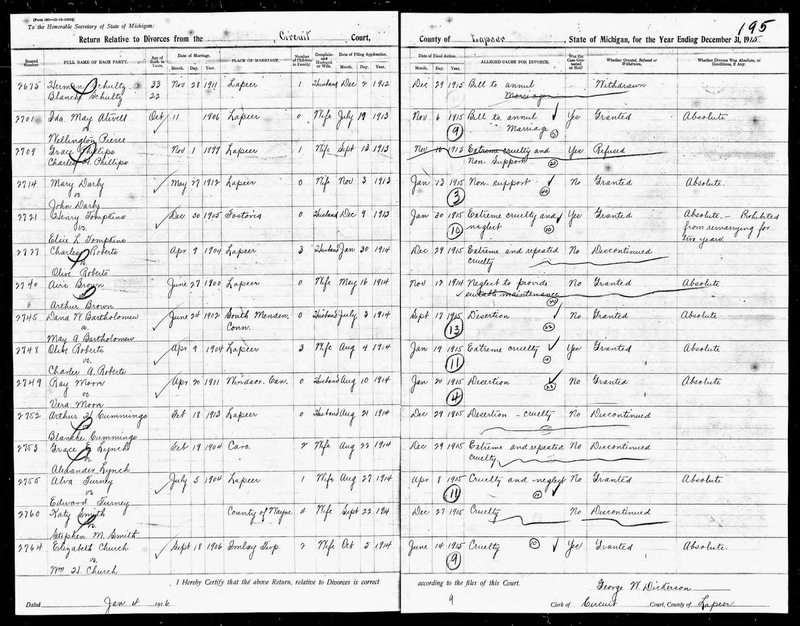 "Michigan, Divorce Records, 1897-1952," online database with images for 1897 - 1938 only, Ancestry.com (http://www.ancestry.com : accessed 12 June 2014), Entry for John and Mary Darby, Rec. no. 2714; citing Michigan Divorce Records, Department of Health, Bureau of Records and Statistics, Lansing, Michigan. Genesee County, Michigan Circuit Court Clerk File Index (unknown volume,) p. 302, referencing file no. 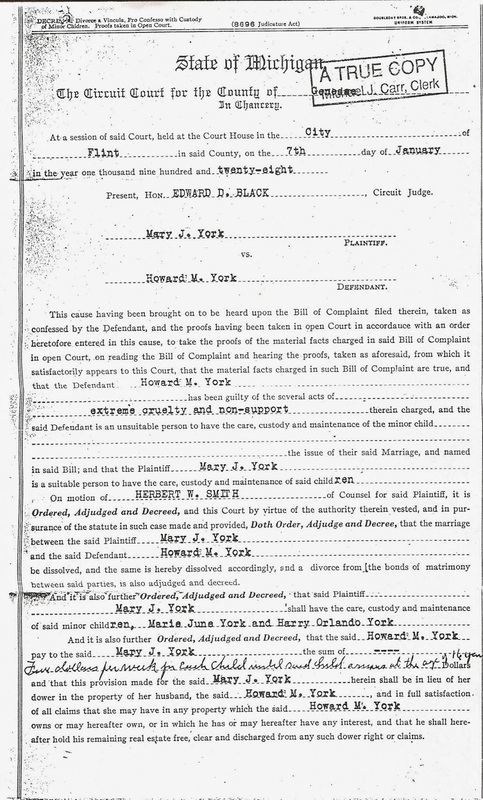 4299, James L. York vs. Mary E. York, "Bill for Divorce, " 21 March through 9 July 1928; County Clerk's Office, Flint Township. Finally, I obtained a 12-page document from the Superior Court of Grand Rapids, Michigan in Chancery for my maternal grandfather's divorce from his first wife. I won't post the images here, but it was a wealth of information including the official Bill of Complaint of the first wife, sworn testimony of the first wife as well as her mother's, and the detailed order with a Dower Clause and custody order for their child. In all these documents, take time to check the details, especially the date and location of the marriage (which I have found to be slightly off or quite incorrect in a small percentage of the cases I've examined), the number of children they may have had (which should lead you to custody information), and mentions of property (leading to deeds, sales, and other court records). 10) People lie in divorce proceedings, or omit/withhold important information to their own advantage. I know this comes as a great shock to you that your ancestors could actually make false statements or accusations against their spouses, or that they might not state all their activities if it made them look bad. So if you get a transcript of the proceedings, read them with the knowledge that not everything that was stated actually was true, or that there might be some important details left out. 11) Get familiar with terminology. When I first read the term "extreme cruelty" years ago in Howard and Mary Jane York's divorce decree, I assumed Howard had been horrendously and physically abusive to Mary Jane. However, as I have analyzed records over the years, I have come to realize that "extreme cruelty" generally means physical or mental harm and in many of the cases I've analyzed, it was related to accusations of adultery where one spouse purportedly flaunted their unfaithfulness or it was generally known by the community. "Next friend" is another term I have seen, which means another person stood in for the plaintiff or defendant because that person either was a minor or incompetent. In both cases I've seen, the "next friend" was the father of the wife in the divorce, who happened to be under the age of 21. A wonderful resource for legal terminology is Judy Russell's The Legal Genealogist; it's a must-read genealogy blog! Bonus Tip: Find out where the "divorce meccas" were for your ancestral locations. Just like some locations were Gretna Greens, where people ran off to get married, others were Divorce Meccas because of short waiting times and short or no residency requirements. Las Vegas is a prime example. For my own Spokane County, Davenport, the county seat in neighboring Lincoln County, Washington, is a Divorce Mecca. Not only is there a shorter waiting time, probably because of a less backed-up, smaller court system, but the divorces granted there are not published in the Spokane paper, which may help those hoping to avoid publicity. The local genealogical society in your ancestral location is sure to know where the nearest Divorce Mecca is. Beyond the desire to uncover a delicious family scandal (admit it, you like finding these! ), divorce records can give insight to some of the subsequent actions and events that occurred in the lives of our ancestors, as well as their children's lives: statistically, children of divorce are more likely to divorce, themselves. More importantly, it should give us empathy and compassion for what were surely traumatizing and perhaps humiliating circumstances at a time when to get a divorce often meant social and religious ostracism. Much luck to you in uncovering these records and getting to know your ancestors just a little bit better! Disclosure: I am an affiliate for Ancestry.com and Amazon.com, and as such, receive compensation for products advertised on and linked from this blog. Genealogy has this way of surprising you by undoing what you know--or thought you knew. My paternal grandfather, Robert Lewis ROBBINS, was named for his mother's side, the LEWIS family. We always knew this. My father told me so. My grandaunt, my grandfather's youngest sister, told me so. My sister gave her youngest son the middle name of Lewis, because he was born on Grandpa's birthday, the first birthday after he passed. My grandfather was a wonderful man. Most of you would agree you had a wonderful man for a grandfather, but mine was special. I never knew anyone who didn't immediately fall in love with my grandpa's gentle spirit, his sense of humor, his work ethic, his homespun wisdom, or his incredible faith. He loved people, and people loved him. Little children especially loved him. He could perform magic tricks, ride a unicycle, and tell funny stories, you see. Neighborhood kids would knock on door of my grandparents' house, and if my grandmother answered, they would ask, "Can Mr. Robbins come out and play?" He was a hero. As a volunteer firefighter, he saved lives and homes. We were never allowed to play with balloons as small children, because grandpa had a sad story of a life he didn't save: a young child who sucked on a balloon until it popped, the force of the burst causing the fragments of balloon down the windpipe, suffocating the child. As a flight mechanic in the U.S. Army Air Corps, he saved the lives of the crew on his flight by disobeying the pilot's order to only fuel one of the plane's fuel tanks, in order to reduce weight of the transport. The plane was part of the Alaska Division, Air Transport Command which flew military supplies and mail from Canada to Alaska and then again from Canada to Minnesota and North Dakota. On that particular flight, the pilot got lost. He ran out of the fuel for the one engine. If Grandpa hadn't used his common sense that day and fueled both tanks, I wouldn't be here, nor would over 30 of my family members. He was definitely a LEWIS. He was on the short side, just like his mother, who was only four feet, eleven inches tall. He might have had the ROBBINS ears, but he had the LEWIS nose, just like my dad and my siblings do. He was inspired by his own Grandpa LEWIS, a quiet but spunky carpenter who encouraged Grandpa when he started his own business as an auto body repairman after the war. Originally from Michigan, the fingers Grandpa had frozen flying near the North Pole during the war could not handle the cold Midwest winters. 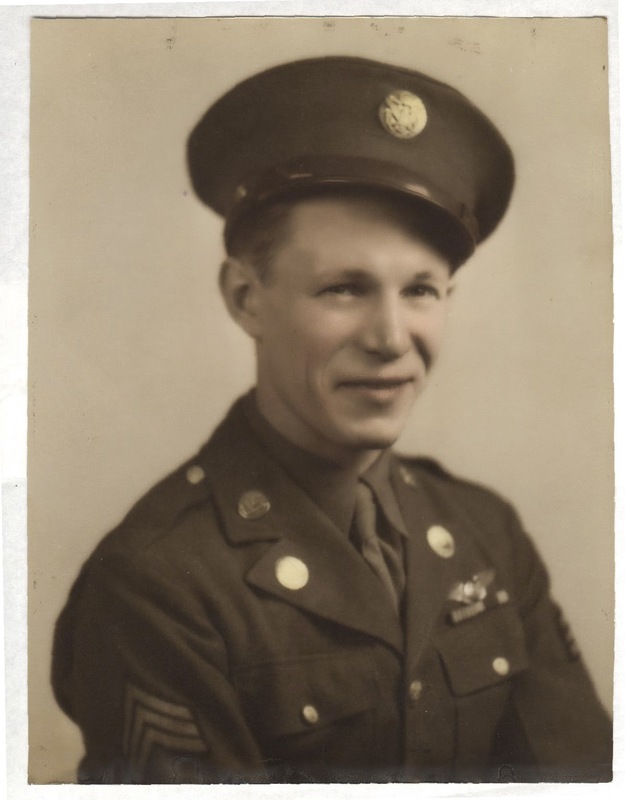 When the children left the (ROBBINS') nest, he and Grandma started spending winters in Texas, where his brother and sister-in-law lived and where his own parents often visited (my great-grandfather also couldn't handle Midwest winters, having served in North Russia during WWI). My grandparents eventually retired in Rockport, Texas, but always visited their children and grandchildren and later, great-grandchildren, in long road trips to Florida, Michigan, and Washington. We mourned his loss when he passed away on 29 December 2003. As a veteran, he was entitled to a free burial at a National Veterans Cemetery, and so he was buried at Fort Sam Houston. What was this? His name was spelled wrong on the veterans website! The military had it wrong! Ugh! More head scratching ensued. Now, I know this document above was not an original record of birth. At the time my grandfather was born, a certificate of birth was required to be filed by the attending physician or midwife, or in their absence, the father or other competent person, within 10 days of birth. The birth was also recorded in Liber 10 on page 40 of the county birth libers (huge official record books). This certificate was filled out by using the information in the liber. My guess is that the original certificate of birth was either lost by my family members, or was never actually issued to them when my grandfather's birth was recorded. You'll note that this copy was created on 3 July 1942, when my grandfather was getting ready to enlist in the Army Air Corps. He would have had to have a record of his birth to show upon his enlistment.There are at least two errors in the above certificate: the first is that my great-grandfather's middle initial is given as "S." His middle name was Bryan , so likely the handwritten liber entry was misread. The second error is a corrected typo where my great-grandfather's last name was spelled "Ribbins." If there could be these errors, there could be more. Perhaps the clerk glanced at the liber entry and assumed the handwritten "Lewis" said "Louis," just as they mistakenly entered "Wm. S. Riobbins" for "Wm. B. Robbins." This prompted my next question: did Grandpa acknowledge this spelling of his name? Did he really believe it was "Louis" rather than "Lewis"? Every other document I could find for him from his marriage record to his driver's license, every signature I found from his youth to old age, simply stated "Robert L. Robbins." So there was the answer to my question: Robert Louis ROBBINS did indeed acknowledge this spelling of his name. I still don't know if this spelling was intentional or accidental. Only a look at the county liber book to determine with my own eyes what was written there will satisfy me somewhat that it may have intended to be "Louis." It won't completely erase all doubt, as I don't know what the original certificate issued close to birth said (if there was one), nor do I know my great-grandparents' intentions. Regardless, my grandfather was both a ROBBINS and a LEWIS. And genealogy will continue to send many surprises my way, which is part of the addiction of it all! 1. Robbins family traditions regarding Robert L. Robbins (1920-2003), Miriam Robbins, compiler (privately held by M. Robbins [ADDRESS FOR PRIVATE USE,] Spokane, Washington. 2. J. Sanders, Tulsa, Oklahoma [(CONTACT INFO FOR PRIVATE USE),] to Miriam J. Robbins, private Facebook message, 28 April 2013, no subject; privately held by Robbins [(CONTACT INFO) & STREET ADDRESS FOR PRIVATE USE,] Spokane, Washington. 3. Robbins family traditions about Robert L. Robbins (1920-2003). 7. Robert L. Robbins (Coopersville, Michigan) to "Dear...Miriam...." [Robbins Midkiff]. Letter, 28 August 1991. Privately held by M. Robbins, [ADDRESS FOR PRIVATE USE,] Spokane, Washington. 2014. 8. Miriam Robbins, "1. A Polar Bear in North Russia," AnceStories: The Stories of My Ancestors, 16 July 2007 (http://ancestories1.blogspot.com/2007/07/polar-bear-in-north-russia.html : accessed 15 June 2014). 9. Personal knowledge of Miriam Robbins [ADDRESS FOR PRIVATE USE,] Spokane, Washington. Robbins, the granddaughter of Robert L. Robbins, was a host of her grandparents on numerous visits. 10. City of Corpus Christi, Texas, death certificate no. 097490 (2003), Robert Louis Robbins; Bureau of Vital Statistics, Corpus Christi-Nueces County Health Department, Corpus Christi. 12. ---, Find A Grave, database and images (http://www.findagrave.com/cgi-bin/fg.cgi?page=gr&GRid=8682931 : accessed 15 June 2014), photograph, gravestone for Robert L. Robbins (1920-2003), Ft. Sam Houston National Cemetery, San Antonio, Texas. 13. 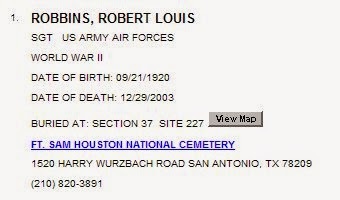 United States Department of Veterans Affairs, "Nationwide Gravesite Locator," database, Nationwide Gravesite Locator (http://gravelocator.cem.va.gov/ : accessed 15 June 2014), database entry for Robert Louis Robbins (1920-2003). 14. 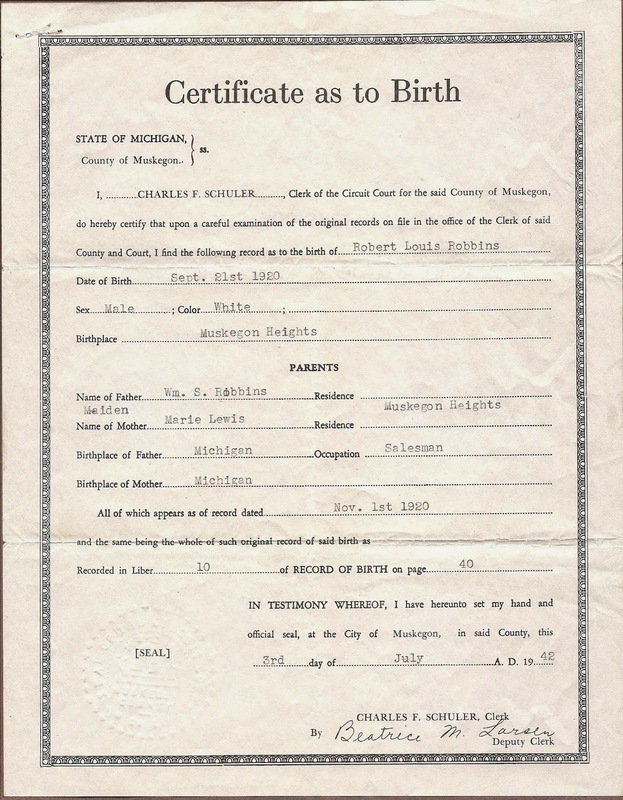 Muskegon County, Michigan, certificate as to birth, citing county birth liber 10, page 40 (1920), Robert Louis Robbins; Muskegon County Clerk's Office, Muskegon. 15. Carol McGinnis, Michigan Genealogy: Sources & Resources, Second Edition (Baltimore: Genealogical Publishing Co., Inc., 2005), 49. 16. Muskegon Co., Mich., certificate as to birth (1920), Robert Louis Robbins. 17. Access to Archival Databases, "World War II Army Enlistment Records," database, U.S. National Archives & Records Administration (http://aad.archives.gov : accessed 22 Apr 2005). 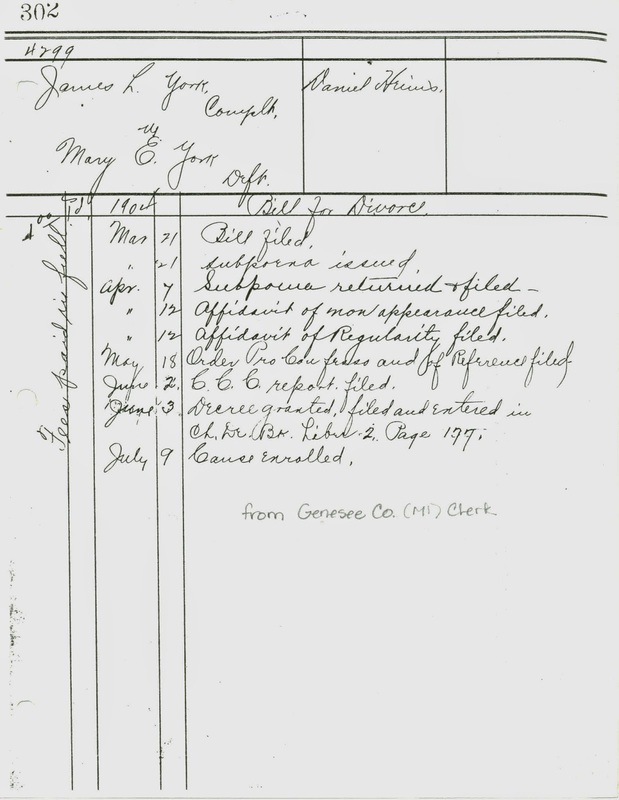 Database entry for Robert L. Robbins, Army serial no. 16086708. 18. Michigan Department of Public Health, death certificate 129632, local file no 72-1749 (1972), William Bryan Robbins; Bureau of Vital Statistics, Lansing. 19. Robert L. Robbins signature, Michigan Driver License, bef. 2000; privately held by Miriam Robbins [ADDRESS FOR PRIVATE USE,] Spokane, Washington, 2014. 20. Robert Louis Robbins signature, Report of Change of Status and Address from the War Department to Robert Louis Robbins, Army serial no. 16086708, Minneapolis, Minnesota, 20 June 1944; digital copy held by Miriam Robbins [ADDRESS FOR PRIVATE USE,] Spokane, Washington, 2014. RENEMA is a Frisian clan name. The Frisians are an ethnic minority in the north of the Netherlands and the west of Germany. Our family oral history indicates that the name came about because the family is descended from a French Huguenot by the name of René who took religious refuge in what would have been the Dutch Republic, sometime during the religious persecutions of the late 17th and early 18th centuries. In 1811, the people of the Netherlands, which had been annexed to France by Napoleon, were required to register a surname with the local government. Before this time, most used patronyms, although it was not unusual for others to already have a surname. The family is more recently found in the vital records of the municipality of Wonseradeel, Friesland, the Netherlands. The municipality, Wonseradeel, was merged with the municipalities of Bolsward, Nijefurd, Sneek, and Wymbritseradeel to become Súdwest-Fryslân (Southwest Friesland) in 2011. Also, before the merge--and even now when reference is made to it--it was spelled Wûnseradiel in the Frisian language. However, Frisian was not recognized by the Dutch government as a second state language until the 1950s and as an official minority language until 1996. In this post, I am using the original municipality name with the Dutch spelling as it was used at the time my ancestors lived there. Ahnentafel #220 - Sieds Freerks RENEMA (1762 - 1834) - registered the RENEMA surname under Napoleon's decree. Born in Makkum, Wonseradeel, he married Akke Klazes BANGMA (1767 - 1813) in 1787. Ahnentafel #110 - Dirk Siedses RENEMA (1797 - 1859) - born in Zurich, Wonseradeel, he married Baukje Wipjkes TERPSTRA (1804 - 1873) in 1824. Ahnentafel #55 - Akke "Aggie" Dirks RENEMA (1832 - 1882) - born in Zurich, she married Wijbren Joukes WIERSMA (1831 - 1909) in 1852. At the time of their marriage, she was already expecting the first of what may have been as many as 17 children! Not all of them have been accounted for at this point, but there were likely two sets of twins in the family. After Akke's death, Wijbren and a number of their children emigrated to Grand Rapids, Kent County, Michigan. Ahentafel #27 - Doetje WIERSMA (1854 - 1916) - My immigrant ancestor. Born in Zurich, she married another Frisian immigrant, Geert Aukes TUINSTRA (1851 - 1928) in 1884 in Grand Rapids. They had 10 children, including a set of twins. She died in Grand Rapids. This signature of my 4th-great-grandfather, Ezra DICKINSON, comes from the marriage license that he applied for on 7 November 1820 in Trumbull County, Ohio. His signature testified that he had made "a solemn oath" that he had attained the age of 21, that his intended, Cynthia PHILLIPS (my 4th-great-grandmother), had attained the age of 18, and they were no closely related than first cousins. Ezra and Cynthia were married five days later, possibly in the community of Fowler, although they both resided in Johnston Township. Their marriage record has the place name Fowler with the marriage return date, so it's not clear if that is the marriage location or just a notation that the return was documented there. Although this was his first marriage, it certainly was not his last. He married four more times, outliving his first four brides, but making his fifth wife a widow when he died 17 September 1886 in Auburn, DeKalb County, Indiana. You can read his published biography here and learn more about his Civil War service here.